Made for LÖVE Jam 2018 over three days. Protect Kelly from nightmare-inducing blobs while she slumbers! You play as a sword in a house with five by five rooms. 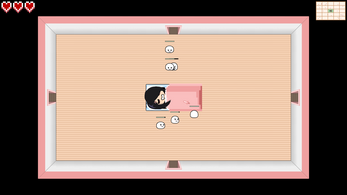 Blobs spawn from the four corners of the house and target the center room, where Kelly sleeps. You are tasked with safeguarding her from their grim influence. Kelly can only endure up to ten blobs occupying her mind before her dream turns into a nightmare! Your mouse cursor will control the sword. Swing it back and forth on enemies to damage them and maneuver through the house by clicking on the doors. 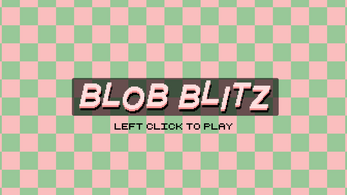 In all rooms except Kelly's, blobs prioritize attacking you with projectile blasts. Each blast that hits you deducts one life. Once all three lives are depleted, you will break, leaving you unable to attack the blobs. However, you can repair yourself and regain lives by mashing the left and right mouse buttons. The amount of lives you have is displayed on the top-left corner of the screen. Red dots on the mini-map indicate enemy positions, while the blue dot indicates your own position. The green room specifies your current location, while the pink room specifies Kelly’s location. The number of blobs Kelly can still bear is also displayed. The mini-map is located on the top-right corner of the screen.